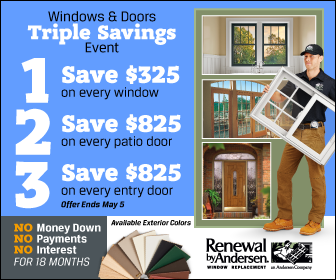 Renewal by Andersen of St. Louis is an independently owned and operated Renewal by Andersen retailer specializing in top quality replacement windows and patio doors. More importantly, we are a local company that understands the challenges of owning a home in the St. Louis area. Each member of our staff is a local resident whose home faces the same storms, the same weather patterns, as yours does. These local ties and our deep wealth of industry knowledge is how we have become the leading local source for replacement windows in St. Louis. As the exclusive Renewal by Andersen retailer in St. Louis, we have access to more than a century of industry experience. Andersen products have revolutionized the window and door industry for over 100 years, changing the home construction industry, how homes are designed, and even how we live in our homes. Renewal by Andersen has always progressed with the times. Their commitment to constantly improving is what drew us here at Renewal by Andersen of St. Louis to become an exclusive Renewal by Andersen retailer. We too are committed to constantly improving our services, because we believe that our neighbors in the St. Louis area deserve the latest and greatest in window and door technology. We also believe that our neighbors deserve peace of mind upon completion of their home improvement project, which is why are pleased to back each of our windows and doors with Renewal by Andersen’s industry-leading warranty. This warranty helps us to create a lasting relationship with our clients, a relationship that we value greatly. Those relationships have led our clients to award us an A+ rating from the BBB (Better Business Bureau), of which we are extremely proud and grateful. To learn more about Renewal by Andersen of St. Louis and to create your own relationship with your leading local contractor, give us a call or fill out our Request an Estimate form and schedule your FREE in-home consultation. If you live in or around St. Louis, you have only one choice for the highest quality replacement windows on the market- Renewal by Andersen of St. Louis. Give us a call today at (314) 332-2364 to start on the path towards a brighter, more valuable home.